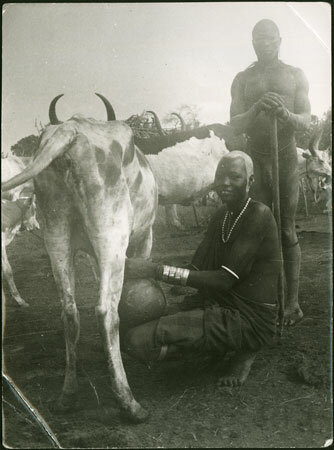 A Mandari cow in a dry-season cattle camp being milked by a girl with white ochre decoration in her hair and metal bracelets. A man stands immediately behind her leaning on a post. This may well be in a Köbora camp which Buxton visited in March and April of 1950 and 1951. Morton, Chris. "Mandari cow being milked" Southern Sudan Project (in development). 03 Jan. 2006. Pitt Rivers Museum. <http://southernsudan.prm.ox.ac.uk/details/1998.97.363.2/>.